Chairperson of the Cherry Garden opening ceremony Mr. Stevenson Manners. NIA-CHARLESTOWN, NEVIS (January 19TH, 2011) — Cars lined the newly developed roads at Prospect, people gathered like bees in a hive on the recently constructed play field at Cherry Garden and vendors took up temporary residence on the sidewalks where they were easily spotted by playful children. 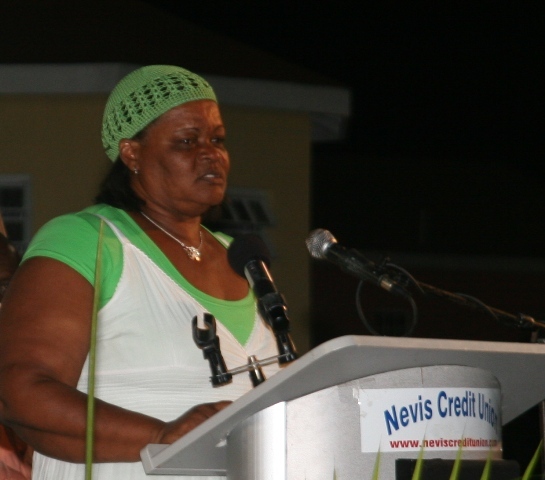 Comments echoed through the crowd ranged from “it looks like Culturama at Cherry Garden” to “look pan nearga” as a large cross-section of the Nevisian community seemed destined to witness last Friday’s [Jan. 14] official opening of the Cherry Garden Housing Development. 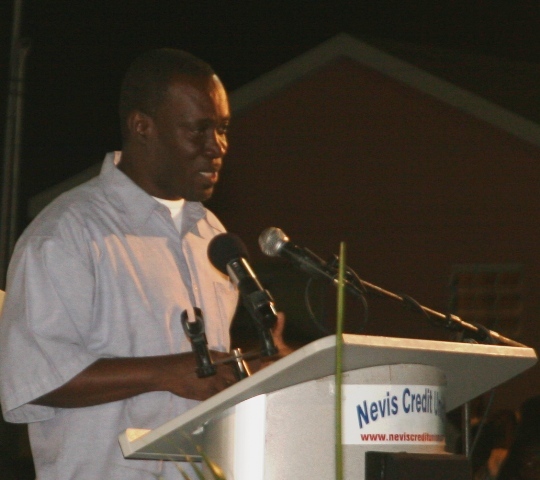 The event, hosted by the Nevis Housing and Land Development Corporation [NHLDC] through the Nevis Island Administration’s [NIA] Ministry of Housing and Land, started as a simple opening ceremony shortly after 6:00 PM, but by 7:30 PM it had quickly transformed into an evening of celebration. While government ministers and NHLDC’s General Manger [GM] Mr. Eustace Nisbett Jr. delivered speeches that explained the logistics of the housing development, many seemed enthused by the outpour of compliments, to the NIA, by Chairperson Mr. Stevenson Manners and homeowners: Mr. Marcellus Lee and Ms. Hilarene Lawrence. Like many others who spoke after him, the Chairperson mentioned the challenging economic period under which the Cherry Garden Housing Development, in addition to several other projects on Nevis, were developed. “This project, developed in the most turbulent economic times the world has experienced in the last 80 years, that is since the Great Depression of the late 1920s early 1930s, is nothing short of a housing revolution,” Mr. Manners said. Known for his strong Caribbean accent, News Anchor and Dominican-born Mr. Lee spoke on behalf of his family when he offered words of gratitude to the NHLDC and the NIA. Mr. Lee singled out the efforts of the island’s Premier the Honourable Joseph Parry, Minister of Housing and Land the Honourable E. Robelto Hector and GM Nisbett. “When I expressed my concerns to Premier Parry, as a non-national in acquiring one of these houses, he said to me don’t worry we are all Caribbean people. Thank you Premier Parry,” he said. “We appreciate the opportunity because once you get an opportunity it gives you the means to go forward,” Mr. Lee explained adding that the island of Nevis had been good to him and his family. “Nevis is my home. 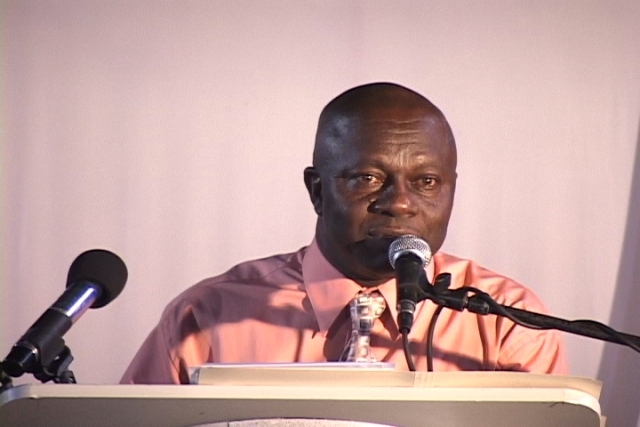 Whenever I go to Dominica I go to visit but Nevis is my home at this point in time,” he said. 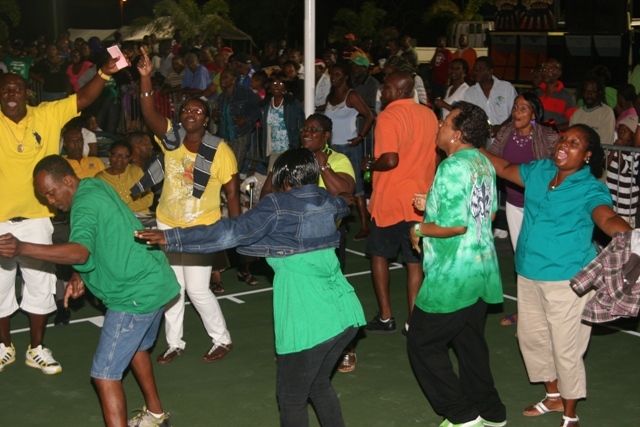 Celebratory atmosphere at Cherry Garden opening ceremony. “I just want to say thanks because a wise man once said there is none so blind as him that would not see: not him that can’t see but him that just would not see. Stuff would be digging you in your eyes and you just don’t see it because you don’t want to see it but Cherry Garden is here for everybody who can see and who wants to see,” she said. As a new resident of Cherry Garden, Homeowner Lawrence offered advice to the island’s Premier who she said had done a superb job. “There is also a saying that says woe be unto you if all men speak well of you. So Premier Parry, don’t expect everybody to speak well of you. [It is] because you are doing a well done job that’s why people are going to talk bad about you. They spoke bad about Jesus Christ who did everything good so don’t expect anything different,” she said. The three-hour long ceremony was punctuated with poems by children residing in the area, cultural dances, steel pan renditions and a performance by calypsonian Rolston Shield known in the calypso arena as King Star Shield.